1. Black twill vest with 4 channels/loops at the back yoke, 1 large back pocket and 4 front pockets; the upper right pocket must have quarter moon shape in the upper right corner, with a smaller rectangular pocket on top of the larger pocket. Vest should be waist length. 2. White or cream color long-sleeve shirt with placket v-neck and short mandarin collar. 5. Black equestrian-type knee-high boots. (leather or leather-look; no laces). 6. Accurate leather gunbelt and buckles with capped holster, correct tools and proper droid caller. 2. Riding seam around the seat and down the back of each pant leg. 4. No visible zipper on the boots. 1. two-tone brown driving gloves. 1. Navy blue or charcoal twill jacket with long sleeves, 4 front pockets, 1 pocket on the left arm and 1 large back pocket. 3. Brown pocketless pants with accurate yellow Corellian bloodstripes. 4. Black leather belt punctured entirely with rows of three holes and a two-prong buckle. 7. 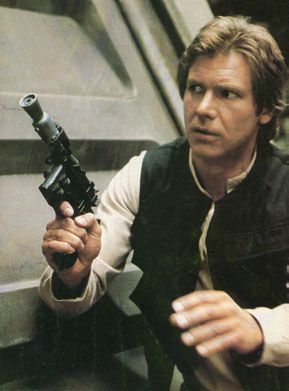 DL-44 blaster (Empire Strikes Back version), unless local laws prohibit or strongly discourage carrying anything that looks like a firearm. 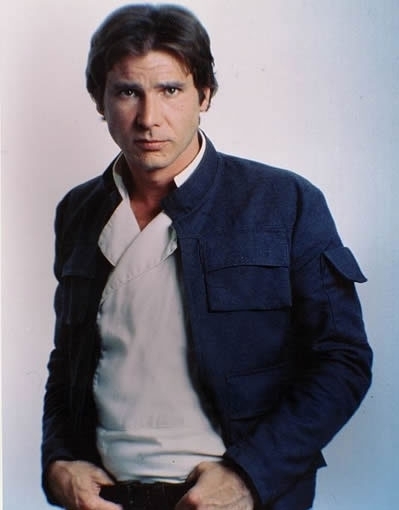 Note: The Dressing a Galaxy book lists the Han Solo jacket as charcoal gray. However, the jacket does look navy in the film, so we allow both navy and charcoal gray versions. 4. Black equestrian-type knee-high boots. (leather or leather-look; no laces). 1. Black twill vest with 4 channels/loops at the back yoke, no back pocket, and 4 front pockets; the upper front pockets must each have a smaller rectangular pocket on top of the larger pocket. Vest should be waist length. 5. No visible zipper on the boots. 2. White or light gray/tan long-sleeve cross-placket shirt with a short mandarin collar. 4. Embroidered bloodstripes. (about 1 inch wide by 1/4 inch high, with only 1/8 of an inch of space between each embroidered section). 2. White or cream color long-sleeve cross-placket shirt with a short mandarin collar. 2. scruffy-looking facial hair / beard. 1. Black twill vest with 4 channels/loops at the back yoke, 1 large back pocket and 4 front pockets; the upper right pocket must have quarter moon shape in the upper right corner with a smaller rectangular pocket on top of the larger pocket. Vest should be waist length. 3. Dark blue or navy pocketless pants with accurate red Correllian bloodstripes. 4. Black leather belt punctured entirely with rows of three holes and a two-prong buckle). 6. Accurate hero Stormtrooper belt (including front boxes) and E11 holster (no thermal detonator). 7. E-11 Stormtrooper blaster, unless local laws prohibit or strongly discourage carrying anything that looks like a firearm. 1. Pintuck down the center front of each pant leg. 3. Embroidered bloodstripes. (about 1 inch wide by 1/4 inch high, with only 1/8 of an inch of space between each embroidered section). 3. Light gray or tan pants with quilted knees. 4. Light gray or tan suede boots with suede wraps around them and 3 white straps on each. 5. Light gray gauntlet style suede gloves with comlink on left wrist. 6. White rimmed ski goggles with clear (colourless) lenses. 10. White electrobinoculars with attached shoulder-strap.